Throughout my entire life I’ve been pretty good at taking exams, but the Principles & Practice of Engineering Exam was one test that I was, quite frankly, dreading. First off, you may ask, why was Felix even taking this exam? Isn’t he out of school? Isn’t he already a mechanical engineer? Isn’t he semi-retired? Well, yes. But I do some part-time work on occasion, including consulting work. And legally, in any state, in order to do engineering work for the public without theoretically raising the ire of the state engineering board, one needs to be a licensed Professional Engineer (P.E.) This requires passing the Fundamentals of Engineering exam (which, thank goodness, I already did in 1999), at least eight years of engineering experience (four of those years can be in college), obtaining enough references to vouch for those years of experience… and passing the PE exam. The latter is no piece of cake for even the most experienced engineers. To underscore that, the pass rate for the last PE Mechanical exam was 70% for first-time takers, 34% for repeat takers, and just ~40% overall. Forty percent! It was dreadful to think that for each ten people who’d take the test at any one time, six would fail. On the other hand, this motivated me to study a lot—as in 6-10 hours a day, for 3.5 weeks. I read all 700 pages (or whatever) of Michael Lindeburg’s Mechanical Engineering Reference Manual for the PE Exam, which is basically the bible for the PE Mechanical exam. I also did a few practice tests, including an online diagnostic exam by the NCEES, and a (much more difficult) Mechanical PE Sample Examination by Michael Lindeburg. The real exam was 8 hours long. There were also some other interesting rules: one could only use a calculator from a very short approved list of models, with all other digital devices (aside from a non-calculator watch) being banned; one could bring food and drink, but all liquids had to be on the floor; and no one was allowed to bring loose sheets of paper, their own writing instruments like pencils and pens, and even erasers. We were allowed to bring any reference books of our choosing, however. With all these rules in mind, on exam day I woke up at 5:00 a.m. and drove down to Denver for an ultra-marathon day of engineering problems. Lining up for the test was eerily reminiscent of trying to get through an airport security screening, with government-issued photo identification in hand and suitcases in tow. Yes, suitcases. About 90% of all people were lugging them loaded with reference materials. “And I thought I brought too many books already,” remarked a woman who, like me, had just brought a backpack—one that a typical 8th grader would haul, and not the icebox-sized camping packs that a few people had strapped over their shoulders. The similarities with airports ended at the photo ID checkpoints. Instead of a modestly plush waiting lounge, we entered what appeared to be something resembling a horse corral (minus the dirt) with 175 tables lined up in orderly rows. Indeed, the testing location (the National Western Complex) was exactly where the National Western Stock Show, Rodeo and Horse Show was in January. And the location of VeloSwap in October. In any case, having half a table was appreciated, providing ample room to spread the test booklet and reference materials out. There were about 350 test takers in the room, although only about 50 of them were taking the Mechanical PE exam. The others were taking other engineering disciplines such as civil (probably the majority), electrical, structural, and even nuclear (I think), plus several more. At 8:15 a.m., it was time to get to work. The test was broken into two four-hour sections. The first tested general knowledge of a wide array of engineering topics. For the Mechanical exam, this included thermodynamics, heat transfer, fluid mechanics and dynamics, mechanical design, materials, standards, and even engineering economics. In the second half, one could choose from one of three “depth” topics: HVAC and refrigeration, Machine Design, or Thermal and Fluids Systems. Naturally, I chose design, my specialty and engineering topic I enjoy the most. One should probably decide which of these topics he would do (and hence study a lot for) well before even arriving at the exam site. Legally, I can’t divulge any of the specific questions on the exam, but will say that NCEES’ own diagnostic exam was much more representative of the real thing than Lindeburg’s Mechanical PE Sample Examination, although I highly recommend doing both. If you can do the latter, the real thing will be easy as pie for you, assuming you are not a complete idiot chef. So how did I do? I won’t know for sure until I receive the results in August! But, I have a fairly high degree of confidence that I passed. The first half, I was able to do every single problem (even finishing with five minutes to spare), and doubt I missed more than three or four—or at least 90% correct. The second half proved to be more difficult. I was unable to do five questions before time ran out, but at least I have a one-out-of-four chance of getting those correct. Additionally, I was unsure of another five. Still, even if I missed all ten of those questions, I still got 75% right—for an overall score of ~83%. Study, study, study. Unlike the Fundamentals of Engineering exam (which, back in 1999, I studied about five hours total), you can’t just “wing it” unless you are a direct descendent of Albert Einstein. I put in about 150 hours of preparation time. Some people recommend 300 hours. There were several topics on the exam that, in college, were never taught, or I did not learn very well in the first place, or simply forgot. Michael Lindeburg’s Mechanical Engineering Reference Manual for the PE Exam is an absolutely critical reference manual/study guide to have. Spend >90% of your time just reviewing this book. 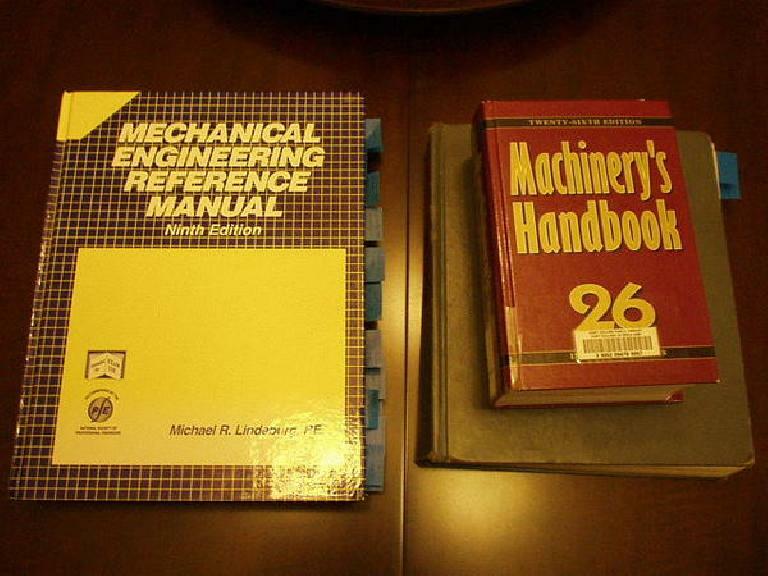 In addition, for the test, I brought Shigley's Mechanical Engineering Design and the Machinery's Handbook, and found both of those useful for answering a few questions. You do not need the latest edition of any of these books. In my opinion after taking the exam, bringing a whole suitcase of books (like what most people were doing) is overkill and unnecessary. In fact, I think it just hogs up more time trying to decide which book to look up for each question and having to rearrange the reference materials frequently. Bring ear plugs for the test! This is the first exam in my life I used ear plugs, and was super glad I did. Even with ear plugs in, I could hear squeaky sliding chairs reverberating in the room every minute or so. Go to the bathroom 10 minutes before the exam. Don’t drink too much before the exam and instead take a sip of water (that you bring) now and then during the test if you get thirsty. You should aim not to have to go to the bathroom during each four-hour section, as that would rob you of at least two minutes. Bring snacks in case you get hungry, as an empty stomach is distracting. I had breakfast before I left home but my stomach started growling in the middle of the first half. I was very glad I brought a box of granola bars which satisfied those hunger pangs. Time management is critical. One has, on average, six minutes per problem. (Thank goodness there were a few 30-second or one-minute questions in there.) Some people recommend spending the first five minutes reading each question and then proceeding to do the easiest ones first. That may be a good idea, except that often entails having to read each question twice (once at the beginning, and another time when you are actually doing the problem.) Instead, I found it effective to 1) look at my watch, 2) read a problem, 3) make a split-second decision as to whether I could do it or six minutes or not, 4) proceed with doing the problem if I thought I could do it in six minutes, 5) move on to the next question if I exceeded those six minutes by more than one or two minutes, and 6) return to those “problematic” questions at the end. Hopefully the above tips make the PE exam a bit less dreadful for any prospective Professional Engineer. Good luck! I think that the procedure has changed a little over the years but when I was in college that had what was called the EIT test (Engineer In Training). If you took that test and passed you could take the regular PE test after 4 years instead of 8. I took the test but never followed it up with the PE exam. You have to think about your college days but my experience was almost exactly the same as yours. I packed my back pack full of text books and thought I was OK. I was astounded to see several people wheeling in little red wagons full of books or boxes full of books. At first I felt like I had underestimated the test. Unlike today, I felt pretty well prepared and only dabbled in my reference material a few times. I also was very consience of clock management. I think that I did something similar to you, spending a minute or so on a question and choosing to answer it now or in pass number 2. Other folks were maddly going thorugh their boxes making quite a racket. It was also 2 parts of 4 hours each. I was disappointed that they didn’t give a score just pass or not. I found your blog today when I was googling the NCEES practice exam you mention (or any interactive practice exam). A friend and coworker took the test (we are also in Denver) this past April and just told me how useful that practice exam was. Unfortunately, the NCEES in their wisdom has discontinued it, and there is no replacement. It’s very disappointing. I am taking it next month and you are the second person to say that it was much more representative of the real test than Lindeburg’s books. I don’t know why NCEES got rid of it but frankly it’s a disservice to the people trying to pass the exam. The ASME has one built in to their DVD review course, but it’s upwards of $600 for the set and I’ve already spent a lot money on a review course and books (I won’t get reimbursed by my company until after I pass the test). Thanks for the write up. Looks like the “long-tail” of google is finding this post in study searches! I did my FE/EIT a year ago and studied a lot and passed. I was 5 years out of college, I graduated a quarter early and missed out on taking it as a senior. My boss is a PE and has been insisting that I get my license since my first day on the job (or maybe the interview). He gave me a copy of the Lindeburg book. I’ll be using that. I may buy the practice questions from NCEES too. They released a new printed addition just recently, but don’t have them online anymore. I’m finally submitting my application forms, so looks like I’ll take the exam in April 09. I do recommend all the additional reference books Lindburg list to be useful. Before you consider yourself ready, you should be able to take the practice exam offered by the NCEES website and pass. Do not expect to get lucky. I’m taking the exam this week for the third and hopefully final time. Hi. I like the post. I agree that time management is critical in passing the PE exam. I wanted to share with you a post that I think will be beneficial for your readers. It is a free cheat sheet (word doc) that everyone can customize to suit their needs. I think tabbing your references is a great way to increase your speed, but I also think that creating your own cheat sheets is one of the best ways to increase your speed. All your equations are in one place and just by creating the cheat sheet, you should be able to remember the equation better.